I’m always looking for ways to repurpose leftovers. I had about 1/2 a Porketta Roast leftover. This recipe took the leftover Porketta Roast put it under the broiler to crisp it up. Then placed it into Butter Lettuce Cups, topped it with a Thai Herbed Sour Cream, Jalapenos, Onions, Purple Cabbage, Cilantro and a Wedge of Lime. Tons of fresh flavor and if you’ve already cooked the porketta roast it only takes about 15 minutes to throw this together. Otherwise put seasoned Porketta Roast into crockpot in the morning. Then prepare the rest of the ingredients to save for later. I usually bake my Porketta Roast in the crockpot on high for 6-8 hours. Mix the first 5 ingredients into a mortar and pestle. Once well combined, empty into a medium sized bowl. Then add Sour Cream, Thai Green Curry Paste, Fish Sauce, Salt and Pepper. Set Aside. Turn oven on to a low broil. Prepare Thai Herbed Sour Cream. Chop Garnishes and remove Butter Lettuce Leaves from Lettuce. Place Shredded Leftover Porketta Roast into a roasting pan, with some of the fat that it was cooked in. Salt and Pepper it. Place it on middle rack and let it get a little crispy. Usually takes just a few minutes. Keep an eye on it, so it doesn’t get overcooked. To serve lay two pieces of butter lettuce inside each other facing opposite directions. That makes a little cup. 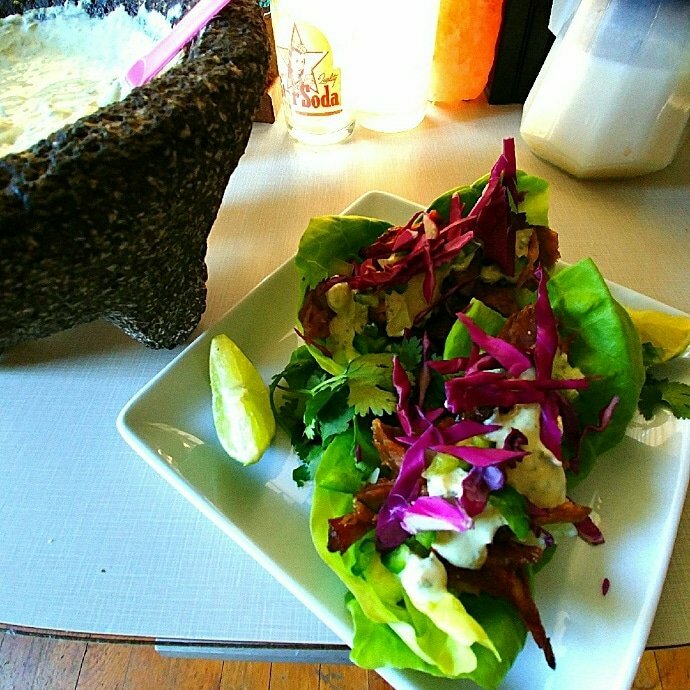 Place Meat inside Lettuce Cups, top with Jalapenos, Onions, Herbed Thai Sour Cream, Purple Cabbage, Cilantro and a Wedge of Lime.